The publisher of the edition I’m reading is one David McKay of Philadelphia, an interesting publisher to say the least. An eclectic house, McKay published the first collection of Shakespeare’s works as well as some of the first comic books in America. This little pocket edition of Smart’s 1755 translation of Horace was just the sort of “high brow” book that publishers liked, since the long dead Smart’s work was public domain and there’d be no royalties disputes. In what is now the familiar story of American publisher as entrepreneurial enterprise gone via conglomerate absorption, McKay was taken over in the 1980’s by Random House, now one of the tentacles of the Bertelsmann octopus. So it goes…. Now, to Horace – well, sort of. It is important to note one matter of importance about Smart’s translation. It isn’t translation, at least as we think of it in the modern sense with a scholar spending much time laboring over equivalencies in idiom and other matters of transferring word meaning in one language to the other language. It is instead literal, word-for-word translation of Latin poetry into 18th century English prose. Why Smart, a gifted poet himself, chose not to do a poetic translation at the time is anyone’s guess. Mine, based on a background in 18th century Brit Lit, is that he did this as a money making job and turned out the translation as quickly as possible. He did, in fact, later make a verse translation of Horace which he hoped would be remembered rather than this prose work. But his prose translation remained widely popular – hence its use in my text. 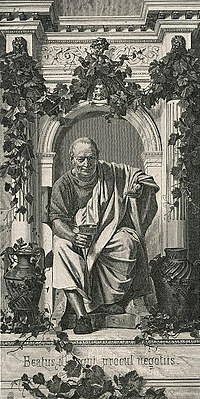 Horace’s Odes were published in four books. The first three were published together as one work and has long been considered by many one of the triumphs of lyric poetry and was indeed considered in his own era the finest work of poetry in classical Latin. For those unfamiliar with the term, a simple way of thinking about the ode would be to liken it to a song. And Horace really likes to sing. We are called upon. If ever, O lyre, in idle amusement in the shade with thee, we have played anything that will live for this year and many, come on, be responsive to a Latin ode, my dear lyre…O thou ornament of Apollo, charming shell, agreeable even at the banquets of supreme Jove! O thou sweet alleviator of anxious toils, be propitious to me, whenever duly invoking thee! Suppress your appetite for the immature grape; shortly variegated autumn will tinge for thee the livid clusters with a purple hue. Shortly she shall follow you; for her impetuous time runs on, and shall place to your account those years of which it abridges you…. Let the robust youth learn patiently to endure pinching want in the active exercise of arms…. It is sweet and glorious to die for one’s country; death even pursues the man that flees from him; nor does he spare the trembling knees of effeminate youth, nor the coward back. For those who might think of Horace as talking the talk and not walking the walk, let me note that he commanded a Roman legion in the civil wars and fought with his troops at the Battle of Philippi – on the side of Brutus. So he knew something about both the terror of war – and about lost causes. Despite Wilfred Owen’s brilliant disputation, the power of Horace’s encomium to patriotism is undeniable. Nevertheless the quick revolving moons repair their wanings in the skies; but when we descend…, we become dust and a mere shade…. When one [is]…dead…not your eloquence nor your piety can restore you. The muse forbids a praiseworthy man to die: the muse confers the happiness of heaven. …if you rank me among the lyric poets, I shall tower to the stars with my exalted head. Inequality in America: can we find ourselves after losing our way? this is a fascinating series jim. well done. i’m too lazy to read the classics myself, but feel slightly embarrassed not to at least have a wikipedia-level acquaintance with them. this helps. Many thanks, Otherwise. Let me recommend “The Meditations of Marcus Aurelius.” Good prose translations available – and in these times his thoughts have a particular resonance.